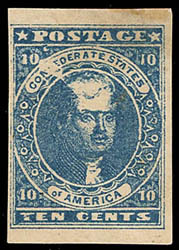 Confederacy, 1861, 10¢ blue, acid flaw on forehead, clear impression, four clear to large margins, part o.g., light crease, Very Fine appearance. Scott No. 2 var. Estimate $200 - 300. 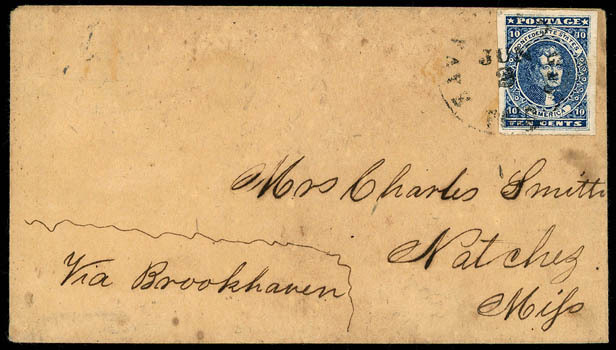 Confederacy, 1861, 10¢ dark blue, Hoyer printing, malformed "T" of "TEN", position 4, intense dark shade, huge margins, tied by "Savannah, Ga., Paid, Jun 2" cds on buff cover to Natchez Miss., endorsed "Via Brookhaven" at bottom left, Very Fine, ex-Caspary. Scott No. 2b var. Estimate $500 - 750. 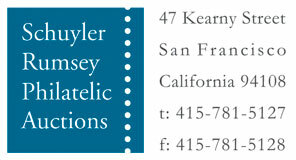 A CHOICE EXAMPLE OF THE MALFORMED "T" OF "TEN" VARIETY. 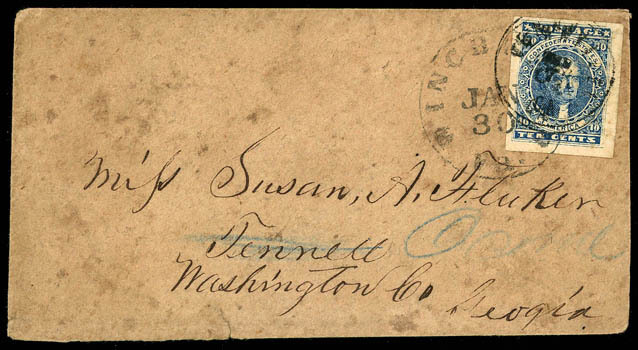 Confederacy, 1861, 10¢ dark blue, shooting star variety, position 14, full to huge margins, sharp impression, tied by "Lynchburg Va., Jan 30" cds on homemade brown cover to Tennille Ga., forwarded to Oconee Ga. with "Tennille Ga" cds also tying stamp, no forwarding postage assessed; cover soiling, bit of flap missing, a Very Fine example of the Shooting Star variety; signed initialed by Peter Powell. C.S.A. Catalog No. 2-H-v5. Scott No. 2b var. Estimate $300 - 400.